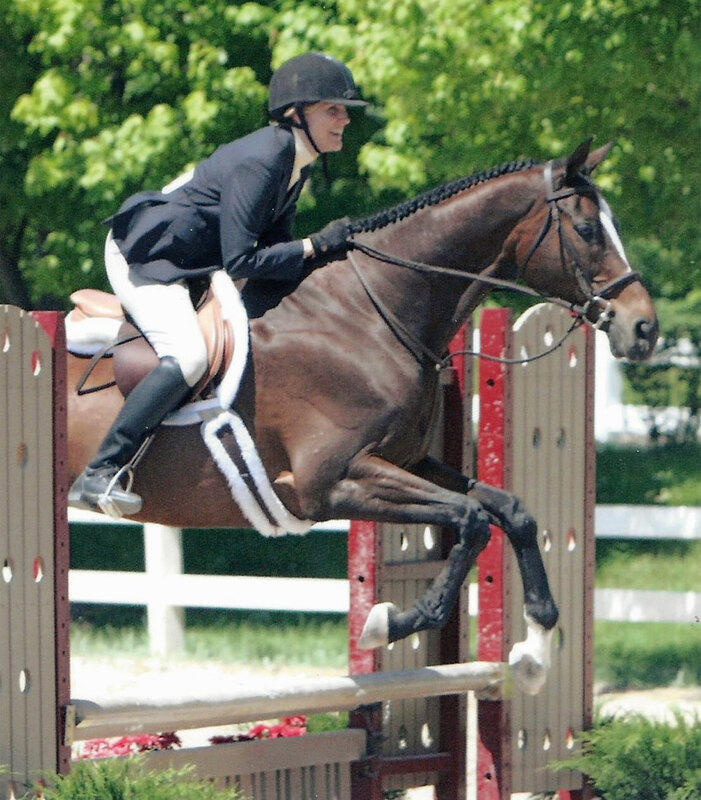 Dating is difficult, but it might be even more so for horsewomen. When I was a girl of 10, newly smitten with horse fever, I wasn’t interested in boys and thought it would be perfect if only I could marry a horse. Two decades later I sometimes feared I might, in fact, have to marry a horse. There seemed to be no suitable human alternative … as evidenced by the blind date standing at my door wearing an orangey leather jacket. “I like your sconces,” he smiled. Did I hear that right? Seriously!? He liked my sconces? What about my hair? My outfit? The wrought iron sconces flanking a large floral print over the sofa in my Los Angeles starter apartment captured Kevin’s attention the moment he stepped inside. I had only just learned what sconces were a few years before when Pottery Barn began mailing me catalogs. Susan and her equine love, Tiz a Knight. Minutes earlier when I opened the door and saw him standing there, I just knew it wasn’t going to work out between us, and I hoped my face didn’t display my disappointment. Kevin was not my physical ideal—at all. And I couldn’t get past the orangey leather jacket. Those factors combined with the sconce compliment threw me off. I had a sixth sense it was going to be a long night. My friend Audrey, who was in a rock band and cut hair for her day job, had set us up. I had been to one of her performances wearing my flashy new lime-green corduroy jacket. Something about having moved to California from Illinois the year before made me kick up my fashion spunkiness a notch. I ditched my Midwestern grays and numerous wool turtlenecks in favor of the vivid green and the colors and fabrics of summer. From across the dusky room I had apparently made quite an impression on Kevin. The next time he got a haircut from Audrey he asked if he could be introduced to the girl in the green jacket he had seen at the concert. I said yes to Audrey’s request to give Kevin my number, and yes again when he called me to ask me out. Kevin showed up to my door wearing a jacket that looked like something worn by a character from the 1970s sitcom “Good Times.” It was the late 1990s, and the only people who were able to wear a clearly out of style jacket and look vintage, thus making the jacket hip, were celebrities or people gorgeous enough that they might be mistaken for a celebrity. Kevin was neither. We began the date at a Starbucks, exchanging niceties over lattes about where we grew up, went to college, and attended church. In addition to the lack of physical attraction, there was very little personality attraction either, but I kept up a cordial conversation because it was my only option. It seemed just because I was from the Midwest, people in California assumed I was sheltered. I felt his question was slightly condescending. We kept the awkward conversation going until we arrived, and Kevin handed the keys to the valet. Off we went into the dark cavern of musical entertainment, where I learned something from what happened next: It’s never a good idea to go to a concert on a blind date. There’s nothing more miserable than sitting in cramped quarters with a virtual stranger listening to music you don’t know, trying to shout above the noise to carry on a conversation. In hindsight, it would have been more pleasant to go to the dentist. The first band to take the stage was a heavy metal Christian band, which was not my preferred genre. The next act was a ska band who were members of a local youth group, and it showed. This band was a definite improvement over the metal band, but after a while, all ska music sounds alike with its islandy beat and bursts of trumpet and trombone. As I sat in the dark balcony next to my date—who was really the belle of the ball, hobnobbing with dozens of people who all seemed to actually enjoy the music—I realized I was tired, bored and ready to go home. My brain provided an escape, allowing me to tolerate the seemingly unending date. As the bands rocked, I envisioned myself riding my horse, jumping a course in a rhythmical canter, navigating various combinations of colorful fences. 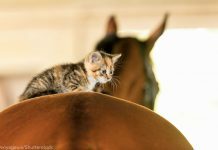 I thought about my barn self, saturated with the aroma of horse and hay, sporting dirt under my fingernails—that was the true me. The young woman on the blind date at the hip club in Hollywood wasn’t really me. Susan’s first Thoroughbred, DC, was a welcome distraction from dating. Dating was awkward and not a fun activity, in spite of what the movies depicted. Yet I knew I had to have an open mind about meeting people if I ever wanted to find that special someone. Even though I was more at home at the stable where my horse lived, it was not a promising venue in which to meet the man of my dreams. Most of my fellow riders were middle-aged women. There were a few men, but they were either gay or old enough to be my dad. The show ended around midnight, and when Kevin and I walked out to meet the valet, he told us he was sorry, but he had accidentally locked the keys in the car. Kevin held a large golf umbrella over us as it had started to mist. There we were in Tinsel Town, under an umbrella with the lights of Sunset Boulevard flickering at us, Kevin in his orangey jacket, I in my green. What a moment it could have been. “Can you get them out?” Kevin asked. The valet said sorry and shook his head. Kevin stood there, defeated and passive. The assertive horse girl in me took over. “Look, you locked the keys in the car,” I said. “You’re the one who needs to get them out. Call a locksmith. We can’t stand here all night in the rain!” What I was really thinking was, Help! I’m having a miserable night and I don’t want this guy to be under any illusion this is a romantic moment. I doooon’t like him. The valet called for a locksmith, but Kevin and I had to wait about 20 minutes under the umbrella until he arrived. My brain has graciously blocked out the umbrella conversation, because one woman can only sustain so much awkward in one night. When the locksmith opened the door and retrieved the car keys, I felt a surge of relief and probably should have kissed him under the Hollywood sky. At last we were on our way, no longer standing in what could have been a perfectly romantic situation with the right man, huddled under an umbrella on Sunset Boulevard at midnight in the rain. Around the halfway point to my apartment when I was perking up thinking about exiting this situation and throwing on my flannel pajamas, Kevin interrupted my thoughts. He looked into his rearview mirror and started slowing down. “I’m being pulled over.” He eased the car to the side of the freeway, and I turned and saw red flashing lights. Yikes! What did that mean? Wasn’t that technically a lie since he had just said he knew what this was about? Definitely not marriage material. I felt less guilty for judging the orangey jacket. Kevin rifled through his glove compartment and center console. The officer looked impatient. “Sorry, officer, I can’t seem to find them.” Kevin moaned and slumped as the officer stepped away for a few minutes. I was still trying to interpret the comment, I know what this is about. Kevin said yes, looking down. He offered an excuse about having been involved in an auto accident and having to go to court. Officer, I’m NOT his lady friend; I’m not even a friend! I’m an innocent bystander on the world’s worst blind date ever. You should have seen how he handled the keys being locked in the car, I thought. The officer continued. “I’m going to cite you, and you’ll need to appear in court. And because you don’t have a license, she’ll have to drive home.” The officer walked away to write up the ticket. I thought, This isn’t OUR anything. There is no OUR! OUR implies togetherness. We are not together! “You know, one of my personality flaws is I’m just a really laid-back person. I know I should have taken care of this before,” Kevin rationalized. I felt a little better after my mini lecture. The police officer returned, handing over the citation. He then made sure we swapped positions in the front seat. I became the driver of Kevin’s red Jetta. Thank God it was not stick shift or I don’t think we would have ever made it home. We drove in silence the remaining 10 miles to my apartment building. Once we arrived I asked Kevin how he was going to make it home since he wasn’t allowed to drive his car. Kevin climbed back into the driver’s seat and said he was going to drive home because it wasn’t far. “I’d like to see you again,” Kevin said. I’ve read a respected relationship author who says you should give each person you date a minimum of five dates. I respectfully disagree. Some dates aren’t worth five minutes of time. Sometimes you just know. This was one of those times. The next time I saw my hairstylist friend, she was very apologetic. I assured her it wasn’t her fault and said even if it weren’t for the police officer getting involved, I don’t think it would have been a love match anyway. I didn’t tell her the part about the odd sconce compliment or the orangey leather jacket. 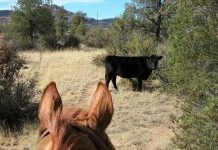 Even though that date was a fiasco and I was still single and not on a bridal path, at least I had a tall, dark, and handsome horse to be my companion on the bridle path. And that realization brought a small measure of comfort to my disappointed heart. 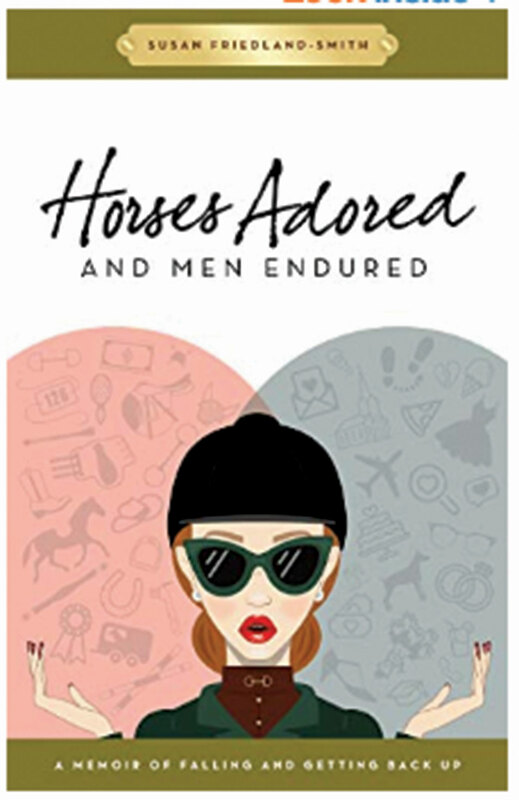 Read the rest of Horses Adored and Men Endured, by Susan Friedland-Smith, available on Amazon.com in both softcover and Kindle formats. 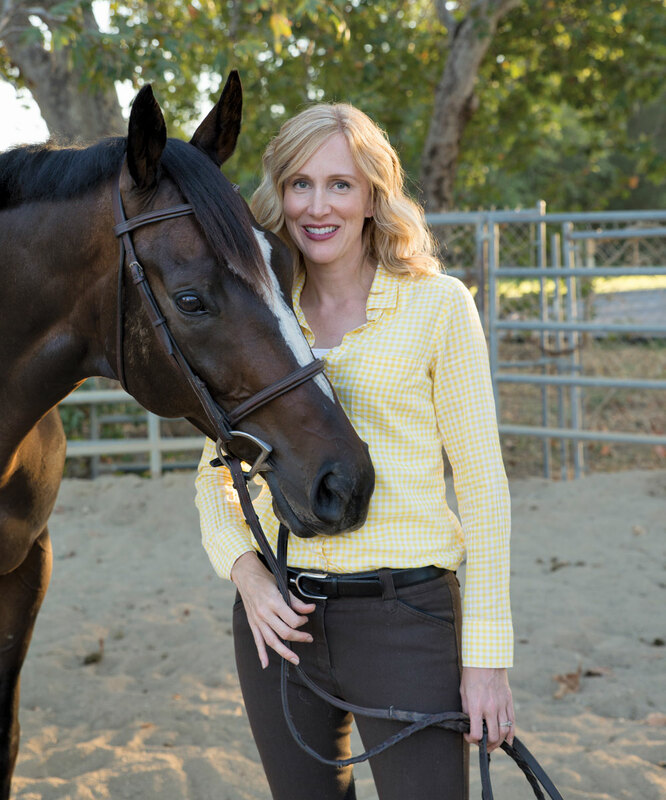 Susan Friedland-Smith of Orange County, Calif., celebrates the horse-centric lifestyle on her award-winning blog Saddle Seeks Horse. 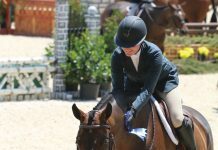 Trot along with Susan and her OTTB Knight at saddleseekshorse.com.